The way brands are managing their customer service is changing. Simply because new, better, and easier ways of interacting with customers are popping up. Are you holding hard to the traditional ways of handling customer service such as customer service line, email, and online support, or are you actively seeking new and more effective ways of handling your customer service? As a brand, you need to be agile and ready to adapt new methods and trends to remain relevant and ahead of your competition. If you don’t, you risk falling behind. Being available for customer service is more important than ever, because for many customers, social media plays a natural and an important part of their life. As a result, social media will be their number one brand outreach tool. You’re missing out 30% of your customers to be more exact. 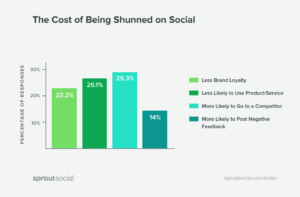 New data from Sprout Social issues a warning to brands everywhere: If you’re not responding on social media, 1 in 3 people say they’ll switch to a competitor. As if that’s not bad enough, 36% say they’ll also shame you on their own social profiles. More correctly, 36% of people have used social to shame a company for poor customer service. In business, being agile and ready to adapt to new trends and changes in the market is vital if you want to survive. It’s understandable that brands ignore certain things because their full focus are placed on other things, but when the statistics speaks as clear as they do about customer service and social media, there’s no good excuse that will justify closing your eyes or looking the other way. Customer service on social media is here and it is more important than ever. 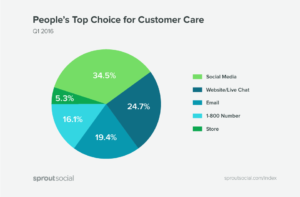 In this article, we’re looking at the statistics that speaks so clearly about the importance of social media customer service, and what you should think about when implementing it into your very own customer service strategy. According to a study by SproutSocial, 34.5% of customers says that social media is their favourite choice for customer care. That’s a huge share – whether you’re a large or small company. More than one-third of companies prefer social media for customer service, so what are you doing about it? If you aren’t there to meet your audience’s needs, things you don’t want to happen happens. In fact, close to 30% of people will go to a competitor if a brand doesn’t respond. But that’s not all. If customers don’t receive a response to their inquiry on social media, 14% are more likely to post negative feedback about your brand. With the fact that 92% of people trusting their peers’ recommendations in mind, the result of negative feedback shared with peers can be devastating for your brand. They say that all publicity is good publicity, but I think it is safe to say that we can cross this one-off the list, and count it as an exception. 26.1% of customers will also be less likely to use your product or service, and 23.2% also say that they will be less loyal to that brand. If you aren’t handling customer service messages in the right manner, or if you aren’t on social media at all, you’ll lose a ton of customers, and your retention rate will drop like a stone. Did you know that on average, loyal customers are worth up to 10 times as much as their first purchase? Well, they are. And that’s also one of the reasons I take customer service so seriously. Great customer service is one of the most effective ways to keep your retention rate high. And when social media is playing such an important role in customer service as it does today, really, there’s no good reason to why you aren’t using it. Okay, the statistics looks frightening for the brand that doesn’t provide a good customer service on social media. However, on the other hand, if you do succeed in providing an excellent customer service experience on social media, the outcome will be completely different. I don’t want to be a negative downer who only talk about the negative aspects. Therefore, I’ve gathered statistics that talk about all the good things that come from providing excellence service. Believe it or not but you can actually see these results! 75% of people are likely to share a good experience on their own profile! Talk about great exposure! Again, the fact that 92% of people trust peer recommendations above all other form of advertising plays an important role. Only this time, it will be highly beneficial for your brand. In fact, 70% of people are more likely to use a brand’s product or service as a result of great customer service on social media. 65% of people will have more brand loyalty if you can provide them with a great service experience. Since customer loyalty is the single most important thing needed to drive a sale, this is something you don’t want to miss out on. If your customers don’t trust you, they’ll never buy from you! As a result of great customer service on social media 25% of people are also less likely to go to a competitor, thus increasing your retention rate. And I don’t need to go more into detail on why customer customer retention is so valuable to brands, becauseI’ve already touched briefly on it. Simply put, returning customers are spending much more than one-time customers. For the sake of efficiency, I’ll decide. Let’s take the bad news first. The bad news i that 89% of social messages go ignored. We’ve already looked at the costs of not responding to a message on social, but what we can say, though, is that it will be very costly for you if you don’t. Brands reply to 11% of people (this number has been stuck since 2015.). That means that there are at least some brands who put great emphasis in providing their customers with great customer service on social media. My goal with this article is that you can be one of them! It’s clear that the importance of being on social and ready to tackle customer service messages is immensely important. 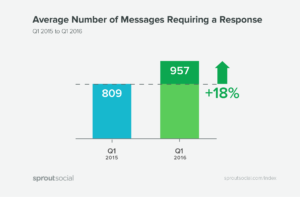 What’s even more interesting is that the number of social messages needing a response from a brand has increased by 18% over the past year. That’s a huge increase in just a year! It’s not only responding that is important when it comes to giving your customers a great impression of your brand, and a great overall customer service experience. In fact, the time it takes you to respond also play an important role. Customers expect brands to respond within 4 hours. The quicker the better. But the reality looks quite different, unfortunately. 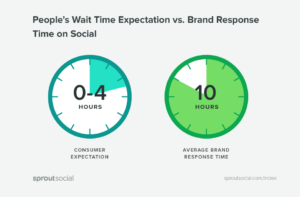 Really, the average response time for brands on social media is 10 hours! That’s more than double of what customers expect it to take. Invest resources that allows you to respond to your customers in a time that leaves them impressed. If you can, be available 24/7 to respond to any questions your customers might have. 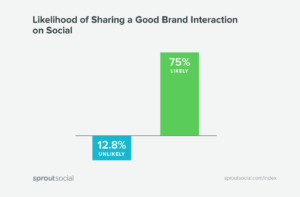 73% of people say they have had a negative experience with a brand on social. And here’s where proof that this is a complex issue appears. 80% of companies say they deliver “superior” customer service. And that sounds amazing! Well done to the brands. Only that the customers’ reality looks a lot different. In fact, only 8% of people think these same companies deliver “superior” customer service. One of these are lying, and I don’t think it’s the customers. Or, companies have a skewed picture of what the reality looks like. Survey your customers regularly and ask them to rate the experience they have had with your brand. Ask questions about their experience and ask them for tips on improvements. The key to being able to provide superior customer service is to talk to the people you are helping and ask them about their point of view. You’d be surprised at how different their perception might be from yours. Social media has evolved into a highly important customer service that more than one-third of customers prefer using. Therefore, it’s important to be there and meet their needs as a brand, and have a proper strategy so you can provide them with superior customer service and keep them coming back for more.